Bitcoin is the most popular cryptocurrency, and with the serious money it is attracting provoking last year’s record highs, more folks are looking to own the virtual currency. There are multiple methods by which you can acquire Bitcoins, including setting up a PC to mine it yourself, paying for a professional mining contract, or trading another cryptocurrency for it. Or you can simply buy Bitcoins for cold, hard cash. In the latter case, the issue then becomes how best to change legal tender into Bitcoins. As Bitcoin is an all-digital virtual currency, the novice buyer might well be a little confused concerning where to start. As Bitcoin is not a physical currency, but a virtual one, it needs to be held in a digital wallet. A popular digital wallet is Blockchain, and an account can be created there in which you can keep your digital money; it offers a web interface as well as smartphone apps. While some Bitcoin exchanges also provide a digital wallet feature, we do not recommend this route due to security concerns – exchanges focus more on currency trading, and less on keeping the user’s Bitcoins safe. Online digital wallets come at no cost to the user. If you just want to mine bitcoin instead, check out our guide here as well as a list of the best bitcoin exchanges. In order to purchase a Bitcoin (or more), the user needs to go to a Bitcoin exchange that deals in their own fiat tender (real currency). A popular one is Coinbase which has an excellent track record as it has exchanged over $20 billion (£15 billion) worth of cash into Bitcoins, with support in 32 countries. In order to perform a purchase on the Coinbase exchange, first you must set up an account. This requires some basic information to be supplied: a name, email, password and location (to make sure your particular location is supported). You also need to be 18 years of age or older. Once the account is created, the next step is to link it with a bank account. When selling Bitcoin on Coinbase, the proceeds can either go to this bank account, or to a PayPal account. Purchases can be made from the linked bank account, or with Mastercard or Visa credit cards. Users then decide how much Bitcoin they would like to purchase. Initially, Coinbase imposes a limit of purchasing $1,000 (£750) worth of Bitcoin per day; when you’re fully verified this limit increases to $50,000 (£37,000) daily. The value of Bitcoin is shown in US dollars. Once a purchase has been agreed, the user will transfer the Bitcoin to their digital wallet to keep the funds secure in what is called a ‘cold storage’ wallet. This is an important step as if it’s not taken, and the exchange goes out of business or has financial difficulty, the user will lose their funds. While Coinbase is a popular place to purchase Bitcoin, it’s hardly the only game in town. Other sites that offer this service include Bitpanda, Bitquick, Localbitcoins, and Spectrocoin. While purchasing Bitcoin via a credit card is the most convenient method for the newbie, it also has a higher risk of transaction fraud, as well as higher processing fees. Using a credit card also limits the amount that can be purchased, for example, Spectrocoin limits users to $50 (£37) of Bitcoin for the initial four days, which then gets increased to $200 (£150) daily, and then $500 (£370) after seven days. 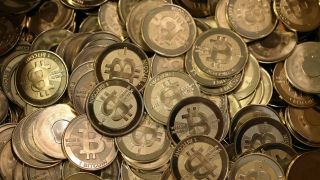 Users should be wary, though, and only deal with a regulated Bitcoin exchange (which fully displays its credentials on the site). Otherwise, there is little stopping a rogue Bitcoin exchange from taking your money and making off with it. While an online exchange is the more common way to purchase Bitcoin, there are certainly other options, such as Bitcoin Depot. This is a series of ATMs across several states in the US that facilitate the purchase of the virtual currency. This is hard to beat for convenience if you happen to be located close to one of these Bitcoin ATMs, and the purchasing process is a breeze – it’s as easy as depositing your cash into the machine, then you own the Bitcoin an hour or so later. However, users complain of high transaction costs of 9%, not to mention a lack of support when an issue arises, and furthermore, unfavorable dollar to Bitcoin exchange rates that are not disclosed upfront. Despite these shortcomings, the Bitcoin ATM is a growing trend with 1,600 of these specialized ATMs installed worldwide, and over 900 in the US from various companies, according to Coin ATM Radar which tracks the numbers of these machines. Furthermore, the number of Bitcoin ATMs is increasing at a healthy 2.86 additional machines installed daily across the globe, so chances are a machine could be near you in the not too distant future. This trend is likely being fueled less by investors, and more by regular folks looking to acquire Bitcoins for use as a currency for purchases. For those looking for something more personal than a Bitcoin ATM or online transaction, LibertyX offers Bitcoin purchases at retail stores, a service more akin to a Western Union Moneygram than virtual currency. So far this is limited to the US, but LibertyX has over 19,000 locations in the country. After users go through a verification process, including providing their mobile phone number, their cash can be changed to Bitcoin, with the reassurance that a clerk is there in case something goes awry. Users can search on the LibertyX website by zip code to find a local retailer near them. Some folks prefer to invest with expert oversight, such as trading in shares of a pool of stocks or bonds, rather than owning them directly – which is better known as a mutual fund. Grayscale’s Bitcoin Investment Trust takes this approach to cryptocurrency trading, claiming to be the “first publicly quoted Bitcoin investment vehicle” according to its website. It gets traded on the OTCQX, which is the highest tier of the OTC Market’s Group for trading over-the-counter stocks. This fund has been around since September 2013, and now has an $807 million (£600 million) valuation, a ticker of GBTC, and a 2% annual fee. While most would not recommend it as a safe investment, but rather consider it more speculative, the YTD performance of +312% is quite solid, and would make any investor drool for that kind of return. With so many options available, Bitcoin is easier to acquire than ever before. It is no wonder that people from all walks of life are buying, owning, and yes, even eventually spending Bitcoins.